In 1964, Braniff airlines was looking for a way to differentiate itself from its competitors by adding a touch of glamour and weirdness to its service. So it hired Italian fashion designer Emilio Pucci to design the uniforms of the stewardesses. What he came up with was the plexiglass Bubble Bonnet, aka the Space Bubble Helmet. Its purpose was supposedly to protect the hair of the stewardesses from wind and rain as they crossed the tarmac. 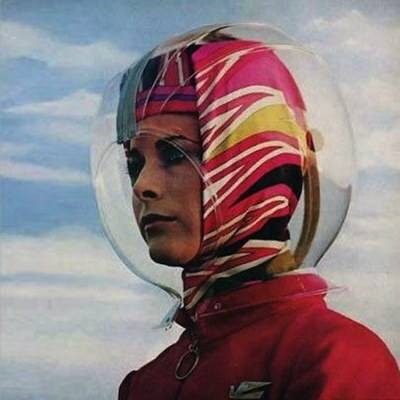 Stewardesses complained that it was hard to hear anyone while wearing the things. Why do I blog this? It looks rather retro-futuristic now but I guess the designer was sincere at the time. A too heavy future though.